Hosseini, S., Dianat, M. (2014). Weed Management in Citrus Orchards in Khuzestan Using Summer Cover Crop Mulch. International Journal of Advanced Biological and Biomedical Research, 2(10), 2696-2703. Seyyed Meisam Hosseini; Marjan Dianat. "Weed Management in Citrus Orchards in Khuzestan Using Summer Cover Crop Mulch". 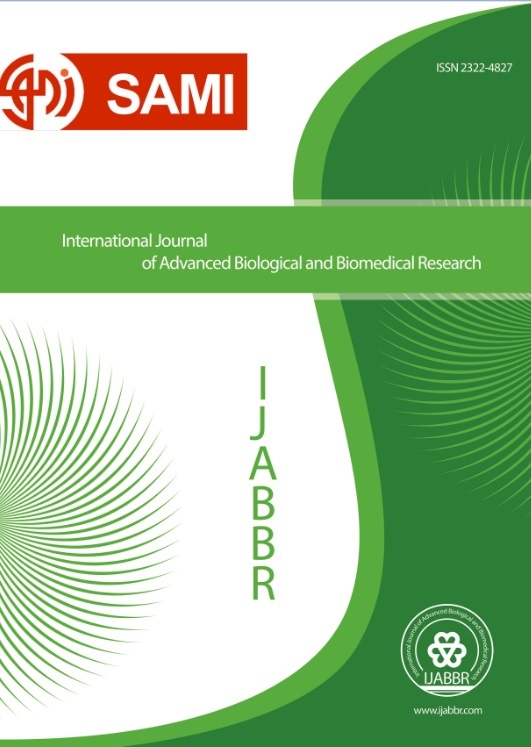 International Journal of Advanced Biological and Biomedical Research, 2, 10, 2014, 2696-2703. Hosseini, S., Dianat, M. (2014). 'Weed Management in Citrus Orchards in Khuzestan Using Summer Cover Crop Mulch', International Journal of Advanced Biological and Biomedical Research, 2(10), pp. 2696-2703. Hosseini, S., Dianat, M. Weed Management in Citrus Orchards in Khuzestan Using Summer Cover Crop Mulch. International Journal of Advanced Biological and Biomedical Research, 2014; 2(10): 2696-2703. Objective: Importance of management of gardens weeds is an issue that unfortunately has less been investigated by weeds researchers of country. One of the most important restrictive agents of cultivated surface and producing crops of Citrus orchards are weeds. Methods: To achieve this purpose, a research was performed in plot of Valencia orange trees of citrus fruits of Dezful in 2013. This project was done in the form of randomized complete block with 16 treatments in 3 repetitions. The treatments were mechanical control, Weedmaster herbicide, glyphosate herbicide, vigna unguiculata, vigna radiate, panicum miliaceum L., sorghum bicolor (L) moench, vigna unguiculata+ Weedmaster , vigna radiate+ Weedmaster, panicum miliaceum L.+ Weedmaster, sorghum bicolor (L) moench+ Weedmaster, vigna unguiculata+ glyphosate, vigna radiate+ glyphosate, panicum miliaceum L.+ glyphosate, sorghum bicolor (L) moench+ glyphosate and wetness (uncontrolled). Results: Results showed that sorghum bicolor (L) moench and it’s combining with glyphosate and Weedmaster have the highest height, leaf area, and dry weight, and panicum miliaceum L. and its combining with glyphosate and Weedmaster herbicides have the highest density of covering crops. Weeds had the least leaf area in treatments of sorghum bicolor (L) moench, sorghum bicolor (L) moench+ Weedmaster and panicum miliaceum L., panicum miliaceum L.+ Weedmaster, and the least productive dry weight of weeds was in treatments of sorghum bicolor (L) moench, sorghum bicolor (L) moench+ Weedmaster and panicum miliaceum L., panicum miliaceum L.+ Weedmaster, and panicum miliaceum L.+ glyphosate. Also, the highest Index CCW belonged to treatments of sorghum bicolor (L) moench+ Weedmaster.